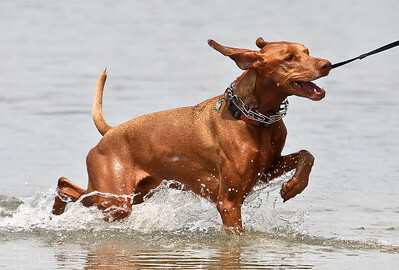 Josh Peckler - Jpeckler@shawmedia.com Arlo runs through the water while playing with his owner at Lake Atwood inside The Hollows Conservation Area in Cary Tuesday, July 3 2012. Temperatures are expected to remain in the high 90s till Friday and will cool off to the high 80s for the weekend. Josh Peckler - Jpeckler@shawmedia.com Stephen Lovejoy of Crystal Lake pull a picnic table while working at Main Beach in Crystal Lake Tuesday, July 3 2012. Temperatures are expected to remain in the high 90s till Friday and will cool off to the high 80s for the weekend. 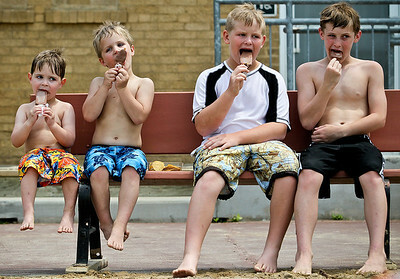 Josh Peckler - Jpeckler@shawmedia.com From left, Drew Washow, 4 of Cary, Christopher Highfill, 5, Matt Ailes, 10 and Caulin Highfill, 10 all of Crystal Lake enjoy chocolate ice cream bars on a bench at Main Beach in Crystal Lake Tuesday, July 3 2012. Temperatures are expected to remain in the high 90s till Friday and will cool off to the high 80s for the weekend. Stephen Lovejoy of Crystal Lake pull a picnic table while working at Main Beach in Crystal Lake Tuesday, July 3 2012. Temperatures are expected to remain in the high 90s till Friday and will cool off to the high 80s for the weekend.